Food Truck Of-The-Week – Food Truck Talk – Searching for the best foodtrucks! Each week we will feature one specific food truck that impresses the heck out of us. We are impressed pretty easily… it could be incredible marketing, superb food, a great looking truck, a ton of mainstream press and accolades, etc. Sometimes, it can just be a free t-shirt. I told you we are easy! 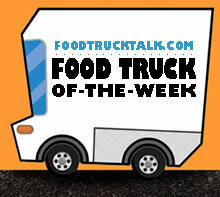 Plus, the luck Food Truck Of-The-Week can use our cool logo on their web site! It’s as prestigious as an Oscar or Emmy or Golden Globe or MTV Award or ESPY. Whatever, you get the idea. If you think you know of a food truck that should be annointed Food Truck Of-The-Week or if you own one let us know! We love to feature the great diversity in the food truck world.